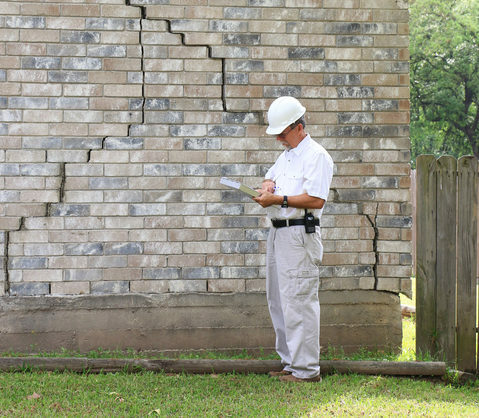 Summer of subsidence: have you spotted cracks? Well, what a summer we had. What was there not to love about it? Gorgeous, sunny days, balmy warm evenings, and – oh – the risk of our houses falling down thanks to whopping great cracks. Yep, the hot weather may mean cocktails, barbecues and holidays to most of us but for some, it also means bad news for our houses since hot temperatures can significantly increase the risk of subsidence. According to reports several insurers are expecting a big increase in subsidence claims as a result of the soaring temperatures this summer, with the areas with the hottest weather (traditionally the South East) expected to have been hardest hit. Certain types of soil (primarily clay soil) can sink and shift in hot weather causing the ground to become unstable and the foundations to move. Before you start panicking it’s worth noting that not all cracks are a sign of subsidence. The crack is likely to be the result of subsidence if it’s thicker than 3mm and is visible both inside and outside the building. You may also notice your wallpaper crinkling at joins. Cracks will likely be diagonal. If you spot signs of subsidence it’s important to contact your insurer immediately. The insurers should be able to recommend the best course of action and if it’s spotted early it’s easier to fix. It may be that your insurer will just monitor the property over the course of a few months if the problem does not seem severe. More serious cases, however, will require fixing and the most common course of action is underpinning. This involves increasing the depth of the foundation of the building to strengthen it and can cost several thousand pounds depending on the size of your house. While there’s not an awful lot you can do about heat waves, there are other steps you can take to reduce the risk of subsidence. Trees can cause issues because their roots absorb moisture from the soil around the property. Make sure you inspect the property regularly too. Any leaks from drains or pipes can cause the soil around the property to soften or wash away, making the foundation unstable. For advice for preventing subsidence and detailed help on what to do (and not do) if you suspect subsidence check out our latest advice guide Subsidence: what is it, how do I spot the signs and what should I do?